Stringerless foam blank, Volan glass. Reduction in length was a major step forwards in performance with a tighter turning arc. - the widepoint was moved back, and in some cases emphasised. - wide planning tail, in many cases with a chamfered tail to adjust water flow. Volume lost by length reduction was offset by increasing width and the deep vee tail and many top surfers continued to kneel paddle, although average surfers could only paddle these boards prone. - many boards continued with a stringerless blank. Rocker was slightly increased, with a bit more nose lift. Rails retained the standard 50/50 egg thin rail. 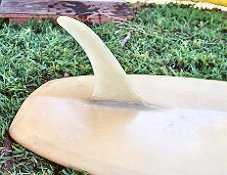 Standard Greenough style fins got finer and longer, in experimentation with extreme flex. Some fins snapped above the base, many show warp or twist. Colour was mostly clear, with decor restricted to decals, volan overlaps and patches. Resin pinlines or pannels were rare, Pigment/tint rarer. Usually only one decal, placed on the deck, at either sweet spot. 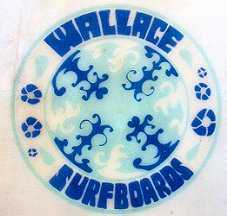 Decals were larger, more colourful and psychedelic/art deco in design, for example George Rice circle. #26 1967 Gordon and Smith, Vee Bottom 7 ft 7"
#3 1968 WM, V-bottom 8 ft 3"